Welcome to the ICS Support System! Welcome to the ICS Support System! You are most likely here because you have a question, or would like to make a request. We’d be more than happy to help you! “Welcome!” takes you to this article. “Register” allows you to create a profile in our ticketing system. “Knowledgebase” takes you to a directory of lots of helpful articles that may be able to answer your question. You can also use the search bar right at the top of every page to search our Knowledgebase and find an article relevant to your needs. “News” takes you to our news feed, which is also displayed on our Home Page. This feed is where we post about updates to our software, updates to our website, and other relevant information. No matter where you navigate to, the navigation bar at the top of the page can always take you back to this document, the Home Page, our Knowledgebase, or our news feed. If you need to speak directly to our support team, you need to put in a ticket. If you have never put in a ticket in our system before, you need to register for an account. Click the “Register” widget to create your account. Once you fill out your information and click the green “Register” button, you will be sent an email asking you to verify your email address. Click the link in the email to verify your email address. This link will take you back to the support site, and you will be logged in to your account. If you have forgotten your password, in the login box, click the “Lost password” link, and you will be sent an email with your new helpdesk account password. 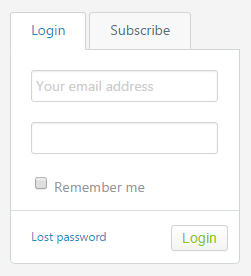 Put your email address and this new password in the login box in the top left corner of the Home Page to login. 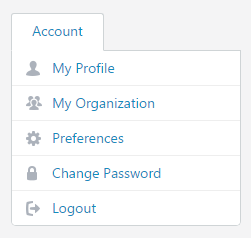 Now that you are logged in, you will see some new widgets on your Home Page, as well as new options on the navigation bar at the top of the page, and an Account menu in place of the login box in the top left corner of the screen. “Submit a Ticket” allows you to create a new ticket, which our support team will receive and address. “My Tickets” brings you to a list of tickets that you have submitted. From the menu, “My Profile” allows you to edit the details about you in your profile. “My Organization” allows you to edit details about your company. “Preferences” allows you to edit your Timezone, edit your language, and subscribe to our News Feed to get emails whenever we publish a news article. You can also change your password with “Change Password” and log out from the menu. To create and submit a new ticket, click the “Submit a Ticket” widget on your Home Page. Select which department your question or concern involves, and click “Next.” Give the ticket a Subject, and then type out your message. Be sure to include as many details regarding your issue or question as you can. You can attach screenshots to your ticket, if applicable, by clicking the “Add File” link below the message box. NOTE: We ask that people who created their own account attach, to only their very first ticket, either their business card or company letterhead with their name on it as a way for us to verify your employment with our client, for security reasons. We also accept confirmation and approval from a colleague already in the ticketing system, so long as they put in a ticket from their account, and put your contact information as an approved administrator in the ticket. When you have finished, click the “Submit” button at the bottom of the screen. You will be given a ticket number and sent an email with the details of your ticket. To view your submitted ticket, click “My Tickets,” either from the Home Page or from the top navigation bar. You can see your ticket in the “View Tickets” list, and you can view your ticket at any time by clicking its subject. When a member of our support staff replies to your ticket, you will be sent an email. Do not reply to this email to reply to the ticket. You will need to log back into the ticketing system to reply to the ticket. Click on “My Tickets,” click on the ticket subject to view the support staff’s response, and then click “Add Reply” above the message thread to reply to the ticket. When a ticket has been resolved and is closed by a support staff member, the ticket will be removed from the “View Tickets” list. However, you are still able to view closed tickets. From the “My Tickets” page, click “View Resolved Tickets” in the top right corner of the page. Closed tickets will appear in the “View Tickets” list. To re-open a ticket in the list of closed tickets, simply click the subject of the ticket and click “Add Reply” just like you would for an open ticket that you are replying to. It always depends on the issue or question, but most often, you will find that we usually need the same information for similar scenarios, at least when we first start investigating an inquiry. NOTE: If you have a question about Inquisiq, and you have more than one portal that you manage, be sure to include in your message the name of the portal to which your question applies. If you are experiencing issues uploading a SCORM package, Video, PowerPoint, or other content to your content library, we will usually need the content itself (send via Dropbox if too large to send via ticket/email attachment). You wish to upgrade your system. You wish to get live training from a member of our support staff. You are an Inquisiq administrator installed on one of our servers, and you need us to reset your Control Panel password. Advanced content information and troubleshooting – This includes software publish settings and coding corrections, and it spans all the way to creating courses for you. Should you decide that you would like for ICS Learning Group to build your courses for you, our support team will put you in contact with our content department, who will take over in the consultation process from there. API Access – We offer API Manuals for those who know how to use API, but if you would like for us to help you use outside programs with our systems, we do offer consultation on our API. Database work – Any sort of access to data only found on the database requires advanced database knowledge, which only our advanced technicians can help you with. Database access is considered to be outside of the learning management system, and therefore not covered by the normal support contract. There are many other services that we offer our clients beyond those listed above. Never be afraid to put in a ticket and ask. We’re always happy to answer your questions!